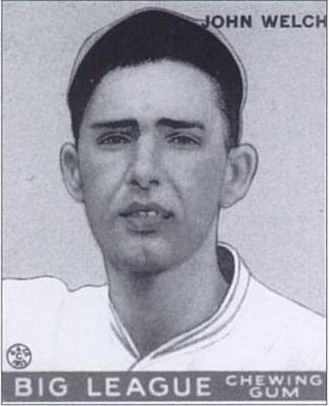 Johnny Welch was a tall, thin right-handed pitcher who had just spent seven futile seasons trying to stick on the Cubs’ big league roster, when he signed with the Red Sox in 1932. That year’s team happened to be one of the worst in the franchise’s history, finishing 43-111 and last in the American League. Because that team had a horrible pitching staff, Welch got a chance to pitch and he responded with a 4-6 record in 20 appearances as both a starter and reliever. The following year, Welch led the Boston staff in appearances as the Sox won 63 games and finished in seventh place. In 1934, “The Boy Wonder,” Bucky Harris, took over as Boston skipper and made Welch a starter. The D.C. native responded by winning 13 games while losing 15, which helped Boston finish in fourth place in the AL with a 76-76 record. Welch followed up with a 10-9 record in 1935 as the Sox finally broke the .500 mark for the first time in seventeen seasons. But Joe Cronin had replaced Harris as Boston manager that season and in 1936, he replaced Welch with Johnny Marcum in Boston’s starting rotation. When the Red Sox tried to send Welch to their Pacific Coast League affiliate in San Diego that same season, Welch refused to report. So Boston put the then 29-year-old pitcher on waivers and he was claimed by the Pirates. After nine appearances in Pittsburgh, Welch was out of the big leagues for good. He and first baseman, Mark Kotsay are the only two former Red Sox I could find who were born on December 2.